I think I've written the phrase "keep an eye out for warnings" in every post I've ever written about thunderstorms. Urging folks to listen up for weather alerts is a mainstay of daily weather forecasts. Most bad storms are warned in advance, but judging by the amount of people who say "we had no warning!" after a major disaster, it makes you wonder just how many people are listening for warnings at all. I have so many weather alerts coming at me during severe weather that the apartment sounds like WUPHF from The Office when there's a severe thunderstorm nearby. I've long been open about the recent reemergence of storm anxiety. There were a couple of times in college I came close to finding myself in a dangerous spot because I didn't hear a severe thunderstorm or tornado warning. One of my roommates chose not to wake me up for a tornado warning one morning even as the sirens blared outside—the tornado touched down not far from campus. It would be pretty embarrassing if I were to die in a tornado or earn myself a new head shape thanks to a hailstone. Could you imagine the fun the tabloid websites would have with that one? Storm Clown Torn Down By Cloudy Beatdown. Well, regardless of the reasoning, I try my best to stay ahead of any storms that come my way, and that's something we should all strive to do. Meteorologists and reporters always tell you to listen for warnings, but what's the best place to look to make sure you hear every warning every time? Here's how I get my warnings. I have a NOAA weather radio. These devices are like smoke detectors for the weather. 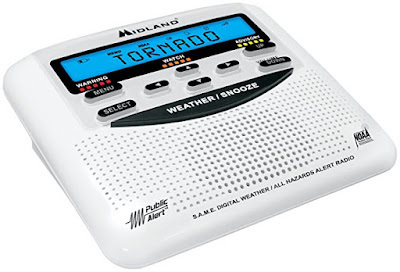 The radios themselves are a bit outdated compared to the technology we have today, but they're a fantastic backup device when dangerous weather is on its way. Each county/parish in the United States has a unique six-digit identifier (called a SAME code) that you can program into your weather radio. If you tune to the right frequency for your area, the radio will listen for that county's code to come across in a watch or warning and it'll sound a loud siren and turn on the audio feed when it hears that code in the broadcast. You know that annoying screeching sound in the Emergency Alert System? That's actually a coded message similar to dial-up, and it's that tone the radio listens for and uses to sound an alert. A basic SAME-enabled weather radio costs somewhere around $30 depending on where you look. More advanced radios—ones that allow you to program which alerts you want to hear and which you'd rather ignore—are a little more expensive, but worth it if you want to tune out some alerts that don't apply to you. 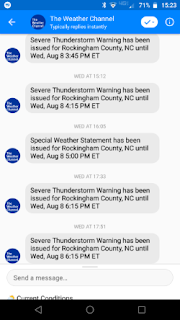 One of the most surprising tools I've found useful during severe weather is The Weather Channel's bot on Facebook Messenger. Facebook Messenger allows companies to set up bots to communicate with you through automated messages. You can use Messenger to do things like order food, discover music through Spotify, receive breaking news alerts from NBC News, and get weather forecasts and severe weather alerts from The Weather Channel. The Weather Channel's severe weather alerts are usually the very first notification I get when a watch or warning is issued for my town. 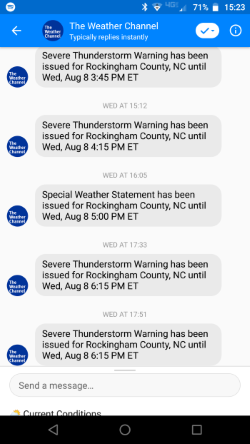 These alerts actually come through to me on Facebook Messenger a second or two before my weather radio goes off. The only downfall to these alerts is that they don't follow you around when you're out and about. You only receive alerts for the location you program into the app. Much like weather radios, this Messenger bot is a great tool if you're at home or the office, but it's not the ideal source for warnings when you're out traveling. The Wireless Emergency Alert System is a default feature on all modern smartphones sold in the United States. The system sends out emergency alerts to users based on their location. This is a great improvement over the county-based method in that only people in a tornado warning will receive a tornado warning. This cuts down on the Crying Wolf effect and ensures the folks who are in harm's way know that they need to take the alert seriously. The only problem with wireless emergency alerts is that people tend to deactivate the feature after one or two annoying disruptions. The main purpose of the system, as with on television and radio, is to allow the President of the United States to quickly communicate with the public in case of a national emergency. 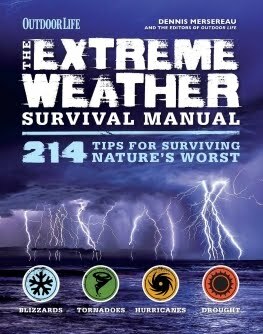 The most common use, though, is for severe weather. 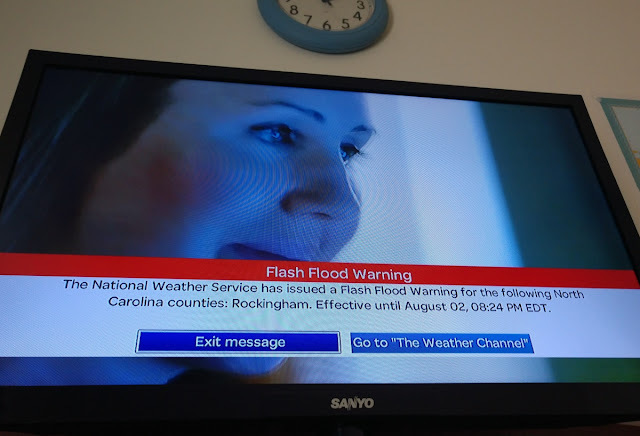 These alerts are typically sent out for tornado warnings and flash flood warnings, but they can be used for hurricane warnings in coastal areas and even dust storm warnings in desert regions. It's a really good idea to look in your phone's settings and make sure these alerts are activated. They may be annoying, but the NWS has found at least one case where these alerts were directly responsible for saved lives. There are more weather apps available on Android and iOS than anyone could possibly cover in one blurb. Heck, I've written enough words about the trustworthiness of apps to fill a book. Most reputable weather apps give you timely severe weather alerts based on your location. If you're going to rely on an app for a potentially life-saving warning, I'd rely on one of the big ones—someone like The Weather Channel, Wunderground, AccuWeather, or WeatherBug. I try to shy away from apps when I'm under the threat for severe weather. My apps sometimes tell me when there's an alert and sometimes they don't. I have The Weather Channel and Wunderground apps on my phone and they both stopped giving me alerts months ago. I don't know if an update tripped a setting or what. Situations like that are why I like redundancy. I like it when my phone and radio and TV all go off at the same time because I know I'm covered when it suddenly sounds like I won a few bucks on a dorky slot machine. A growing trend among towns and counties in the United States is to allow residents to sign up for "Code Red" alerts. These services allow localities to push out emergency alerts to people ahead of events like dangerous weather, police activity, boil water advisories, and road closures. My town in North Carolina, along with many other communities around the country, subscribe to Code Red alerts from OnSolve. Through this program, I receive a text message, email, and phone call when there's an emergency in my area. The lead time is comparable to NOAA Weather Radio. I've only ever had a one-minute delay at most. Check your city or county's website to see if your local government is signed up for the program. When all else fails, it never hurts to flip on the TV or listen to an AM/FM radio. Emergency alerts are broadcast within a few minutes of the issuance of a severe weather alert. Television alerts are usually more useful than ones broadcast over AM/FM radio since they're more targeted to your county. Emergency alerts on the radio have to cover the station's entire listening area.